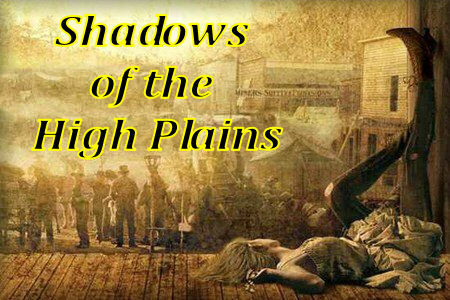 Here is where the stories, circa 1872, about the common man and woman, the heroes, yearning to find and build their place under the sun, and their battles against the ills of society ~ the criminal, the violent braggards, and the weather ~ the eternal struggle between good and evil in the old west, take place. The “Hell on Wheels” town of Sherman, in the Laramie District of the Wyoming Territory is now, and always will be, one of the greatest Shadows of the High Plains. Here in SoHP, we portray characters in a time of heroes, adventure, hardship, and discovery…. a time of stories. Stories that take place in a time period shrouded in the lore of gunslingers, gunfighters, hanging judges, cowboys, runaway herds of cattle, snowstorms, drought, gold rushes, train-robberies, bank-bustin’ and clashin’ with Native Americans. A time and place where outlaws could use the power of the gun to be a power unto themselves. A time when the law man could be gunned down in the street and the community would accept it as merely part of the job, something to be expected. From the beginning of time, people have told stories, relegating their friends, families, and yes, even to anyone that would listen, with tales of adventure, interesting people, frightening experiences, and everyday life of destitution, normal financial means, and over-abundant wealth. Sometimes these were truths; other times, exaggerations; and occasionally nothing more than tall tales. The more interesting stories were passed around from friend-to-friend, from father-to-son, and mother-to-daughter, sometimes altering along the way or growing in strength to the point that they became legends, folklore, or questionable myths. Verbalized history, adages, anecdotes, and popular beliefs were mingled into music, dance, cultures, and sometimes even into history itself. Some stories were even written down in small novellas called Dime Novels, which often inflated the character larger than real life to the unknowing public ! In many of the stories, or shadows of the high plains, told around the campfire or a roaring hearth, can be heard the approach of galloping horses, the whispers of phantoms in ghost towns, the far-off sounds of pistols blazing, and the sighing moans of the winds drifting through the ancient trees of hunting, mining, and cowboy camps. Events grounded in historical fact became the subject of rumor, innuendo, exaggeration, lies, deception, avarice, artistic license and more. Three choices of Applications to choose from, or use your own… as long as it provides equal information.